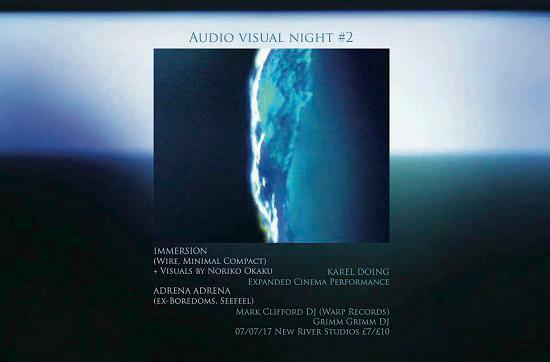 New River Studios in North London will present 'Audio Visual Night #2' on July 7, with performances from Immersion, Adrena Adrena and more. "Immersion is the purest 'version' of Malka and me," says Newman, "because it's not her project, and it’s not my project: it's our project. And musically, it's also got a kind of purity. You can't tell who’s playing or what’s playing." Also performing will be Adrena Adrena, a collaborative project between E-Da Kazuhisa, formerly of Japanese band Boredoms, and visual artist Daisy Dickinson. Their live performance features an 8 foot white sphere with a video mapped onto it. Kazuhisa plays drums while Dickinson live mixes visuals onto the ball. Filmmaker Karel Doing will also provide a special 'Expanded Cinema' performance, while DJ sets come courtesy of Grimm Grimm and Warp Records' Mark Clifford. Tickets are priced between £7 and £10. You can find out more here.